As part of the Consolidated Appropriations Act for fiscal year 2014, Congress authorized a limited number of local projects targeted to assisting disconnected youth. 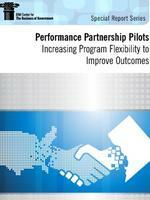 The Performance Partnership Pilots program currently involves participation from seven different federal departments or agencies and is administered by the Department of Education. The pilots are intended to coordinate different federal programs and services from across a range of agencies, allowing local participants to request waivers from various federal requirements in order to enable the integration of different funding streams. The first round of pilots launched last year and a new round of pilots will launch in the near future. What are lessons learned from the first round of pilots that could help in the second round? What mid-stream changes could improve the program? What insights could serve as a model for increased flexibility in social programs in other agencies not participating in the pilots? We hope readers will find the report useful, and that it will stimulate further discussion about how best to implement similar flexibilities in programs that cross multiple levels of government.